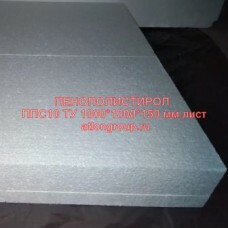 Brand of polystyrene foam are numerous, we welcome you! Various brands of expanded polystyrene and one of them PPS 10 TU 1000h1000h150 mm. This is one of the brands of polystyrene, the most inexpensive and with a minimum density. If you have any questions about the brands of Styrofoam, you can contact us for help. We will help you to understand the labeling of polystyrene and properly insulate your home. Ask your question and we will try to answer it as detailed as possible. We will provide wholesale prices on your request. Price per piece: 210 rubles.